The rotary tool is a handheld power tool that ensures an easy working process for different tasks. With a rotary tool kit, the small jobs in workshop and homes are done in a smooth, appropriate and applicable manner. The high speed, versatility and compact size of the rotary tool make it highly recommended as an alternative power tool. Once you have a rotary tool, you have to know how to use it. 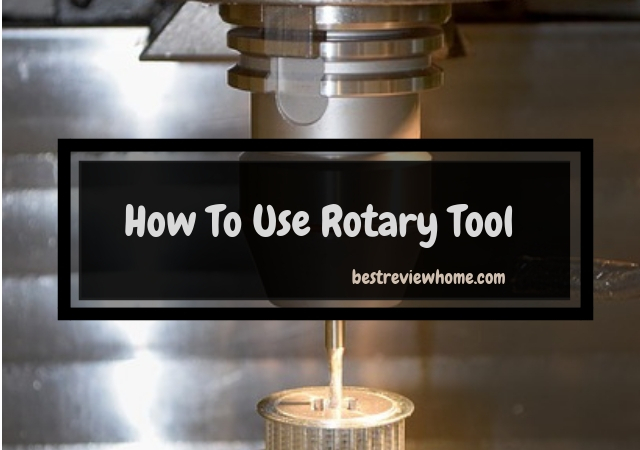 Here you will get a guideline about using the rotary tool and the right use of the accessories that come with the rotary tool. Enjoy the guideline. This is the most versatile tool for any work like shaping, cutting, polishing. You will do all these works at any speed that you want. If you don’t have money to buy all those powerful tools, this small but multipurpose tool is the best alternative. You can work on any surface with this tool and perfect for any kinds of household work. Sometimes while removing a screw, you may face difficulties. At that time a screwdriver doesn’t give you support, you will need a rotary tool for that. All you have to do is you have to attach one metal disc on the rotary machine. Then cut the head slot of the screw with the tool in low power. Then it will be easy to remove the screw with a screwdriver. When you want to repaint your room, removing the oil paint is necessary. But this task is not easy but with a rotary tool with the proper accessories helps to remove the old oil paint perfectly. All you have to do is, you have to attach flap wheels and sanding bands in the rotary tool then starting to sanding on the surface. Thus, the oil paint will get removed easily. To have a perfect countertop, you may need a flat metal sheet. For cutting thin metal sheet properly, a rotary tool is a perfect choice. You will need to attach the carbide metal cutting wheel in the rotary tool while cutting the sheet. If you ask me how to cut ceramic tiles without a drilling machine, then I will say to take a rotary tool with the proper drilling bit. It works smoothly. Just you have to know which drilling bit will work on which surface then use it on the rotary tool. You will not find any parts of your home use that doesn’t have any fiberglass. For cutting fiberglass, you will need a multipurpose cutting bit with the rotary tool. Your cutting task will be easy and smooth. With a sanding wheel of the rotary tool, trimming your little dog’s nail is perfect. Though it may seem unusual, but once you do it you and your pet will enjoy the process. Cutting holes in drywall to decorate walls with different decorative hangers - you have to cut some holes in the wall. Thus cut is not so simple as it seems. It should be done with perfection or else it will cause some damage in the wall pillars. Pick the perfect rotary tool attachment for cutting holes in drywall.after making holes, decorate your house with beautiful hanging paints and qoutes. When you think about small household jobs in home improvement, crafts, customizing and hobby construction then a rotary tool is the must need equipment. This tool is a powerful tool that can be controlled with hand properly. This tool is safe to use, and anyone can use it. You can use a different attachment to cut, polish, sand and carve. You will be impressed to work with this tool. On the purpose of use and torque level, the rotary tools come in different size. Let me explain, when you need to cut a wheel, you will have to attach a cutting wheel attachment so you will need a big rotary tool and again for polishing attachment, a normal size rotary tool is enough. So, you have to pick the required size rotary tool for your work purpose. Remember big size rotary tool requires more power, so if you have small jobs then go for the less powerful rotary tool. A rotary tool is mostly used for designing work. You will just need different kinds of craving bits in different materials with diamond coated ends. With them, any high-quality, durable materials like tiles, glass, steel, and aluminum can be carve and designed correctly. You can also cut any materials with this tool. For cutting purpose, you have to use different kinds of cutting wheels. These wheels are disc made and help to cut any surface with ease. If you need to grind objects to size down, refine and sharpen edges and reshape objects than you can use grinding and sharpening bits on the rotary tool. You can also do polishing work with a rotary tool. There is a polishing bit to use on the rotary tool. You can do polishing with control with constant and ease only by using your hand. The best thing is the polishing will be perfect with the rotary tool. I think you have learned that you can do any creative projects with a rotary tool then you must have a rotary tool of your own. But for safety reasons you have to know how to use a rotary tool as some of the projects needs to use safety gears. If you want to invest in this tool, then try to research more and take advice from expert users. A rotary tool is required for every household works, and it is worth it.